According to the data and stats that were collected, 'Sew Can Do' channel has an excellent rank. In addition 'Sew Can Do' includes a significant share of images in comparison to the text content. The channel mostly uses long articles along with sentence constructions of the basic readability level, which is a result indicating a well-balanced textual content on the channel. Long articles are widely used on 'Sew Can Do' as elaborated and interesting content can help the channel to reach a high number of subscribers. In addition there are a few medium length articles. Intermediate readability level is common for 'Sew Can Do' articles as it addresses the matters that demand certain level of education to be understood. Sometimes the channel gets even more difficult by issuing pieces of advanced readability level (there are just a few of them). In addition the channel contains materials of a basic readability level, making up more than one third of its content. Unfortunately Sew Can Do has no news yet. 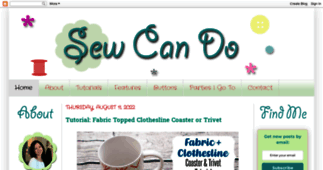 Craftastic Monday Link Party & FREE Advertising for YOUR Blog! Hello October! It's Craftastic Monday Link Party Time. A Labor Day Craftastic Monday Link Party! Craftastic Monday Link Party & Last Day LUV Dream Flats Giveaway! Craftastic Monday Link-Up + New Craftastic Monday Mixer on FB! Let's Get Craftastic! It's time for the Craftastic Monday Link Party.